The blogger never got back to us Neobie .... maybe Phil was fliming final stand ups in Hawaii? And why would Phil give out that info or any of his crew? Sadly, no on could be bothered to listen as we sprinted between two terminals (sent from one to the other and then back via a 10 minute shuttle bus each way). Three airlines, twelve “customer service” representatives and multiple people yelling at each other in Mandarin later we found ourselves on an Air China flight back to Tokyo. We’re still not sure why or what they were screaming but it seemed to be the norm for the airport. That said, it was a lovely airport. Does this point a finger at the "double mint twins" as being one of the final 3 teams on the way to Hawaii? Or are have they been eliminated and just travelling along with the final three? Two teams and Phil? This almost seems more like two eliminated teams rather than final three teams. Welcome to the forum. Thanks for the that tidbit, but as we have seen, decoy teams have had camera crews follow them especially when TAR gets to the final five or so. The eliminated teams do not go to Sequesterville and basically follow the remaining teams to the finish line. And the decoys go through the route to throw off any people (like the Detectives) from finding out the final three. Last season, one of the remaining teams played the decoys in Portland. This we know from the Detectives' great work and from our talk with the teams during the lunch before the season finale. Well we are having a bad ice storm here in the Big D, so I have nothing else to do and came up with this. You guys shoot it down all you like, it will only help. Possible opening scenario of TAR14. termination points of trans-Atlantic flights at Zurich and Milan. overnight sleep over point and leave the next morning at designated time. Nov 2, 2008—Teams make their way to the Verzasca Dam and do the bungy jump roadblock. to Interlaken, either through the Gotthard Tunnel or Simplon Tunnel. Hellbrum in Salzburg for pit stop. where the Pit Stop mat had been the night before. Believe me, I would love to see it. I would love another all-female make it to give them a chance. Dustin & Kandice were so close in All-Stars. Dr. Rox, I am not attempting to "shoot it down" as I respect your thinking even though I do not agree with all of it. Let's start with the biggest problem area, which is number of legs. We know from Bertram van Munster that there are 12 legs in AR14. He has been known to get things not quite right, but I believe him here. My timeline (see Timelines and Flight Information thread) calls for three total legs in Locarno, Interlaken and Salzburg. Then there is Romania, Krasnoyarsk, Novosibirsk, somewhere in India, Phuket, an unkown location (leaning toward agreemeent on Thailand but that is irrelevant for the purpose of this analysis), Guilin, Beijing and Hawaii fof a total of 9. 9+4 = 13, which is one too many. There can be only 3 legs in Switzerland, whatever parts of Italy and Germany might be traversed, and Austria or the total get too high. Your thought that Cheese will be a ROADBLOCK is a good one. Your thought that it should be done in Switzerland (even though you have to steal a ROADBLOCK from the Interlaken are to make room there for such a ROADBLOCK) is even better. It almost for sure is going to be Switzerland, not Obermaiselstein. I think Obermaiselstein is possible, but not probable. The company there that you have cited for a task could move its plane to either Switzerland or to Salzburg to accomplish the same result. Your thought that teams will make their wasy to Locarno, arriving mid-afternoon after a flight and train and/or bus combinations, and then go to sleep needs improvement. I think teams will do tasks in Locarno to until there is a "pick a number" board which will be the setup for the following morning at Verzasca Dam, then they will rest. In the morning I see Verzasca Dam and then the end of leg 1 with a TBC so they can keep going and arrive in Interlaken in the early afternoon. In Interlaken teams will do the full range of tasks for leg 2(including cheese) and have a pit stop. For leg 3 the tranportation mode to Salzburg could be car (it's more efficient than I originally thought), train to the plane via Zurich, and even train all the way. I see no big favorite here, but the self-navigation is always fun to watch, so I hope that it is by car. I know that this concept puts a ROADBLOCK into leg 1 but you can't do both Verzasca Dam and cheese in leg 2. A minor aside is that no respectable train would take the Gotthard Tunnel to go from Locarno to Interlaken. The Simplon tunnel between Domodossola and Brig is the only one that makes sense. The gotthard tunnel route is much longer and takes more time. I LOVE that spec summary, it always helps to see things laid out. But I think that the first episode (ie leg 1) will include Los Alamitos through Interlaken, leaving Salzburg as Leg 2. BVM did say we would have a death defying stunt in Leg 1, I believe, which has to be the bungee. About the cheese its a team task .. Cheese! This is going to be so awesome! I thought we new cheese was a team task lol The montage cleared all that up ! I don't think I added a leg. So maybe Leg 1 Roadblock is bungy jump in Locano and Detour is ?? or Cheese in Interlaken, since the cheese run was found there. We know the teams were split 7/4 on the flights to Europe. In that one vidcap, Margie/Luke appear to be holding a card with the number 8 on it. I think that determines the order the teams get to do the bungy jump the next morning. I also think that it means that they were on the later flight to Europe and the 7 teams from Frankfurt airport had already checked in and got their cards. They certainly could do some tasks in Locarno before arriving at the check in, but, like Peach, I do not think it is a Pit Stop in Locarno. By the time they get to that check in, they have been going for at least 24 hours. 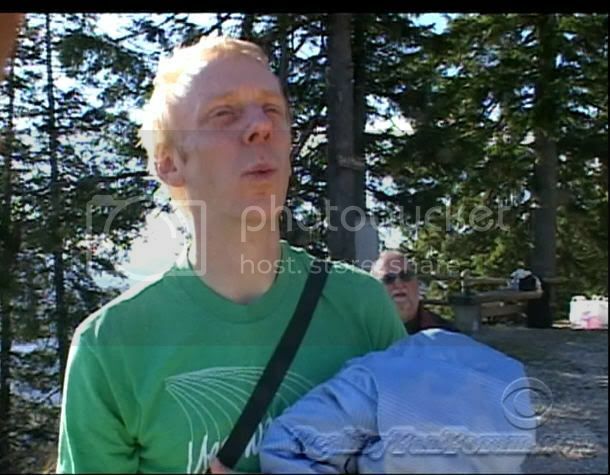 So a pre-planned rest period before the HOH task at the dam makes sense to me. Edited to remove Segway event from first leg. Segway belongs in 2nd leg. I like it Rox, that all works for me! We were in the Guangzhou China airport November 17th around 11pm and saw a team of two caucasian men wearing backpacks running through the airport with a cameraman and producer in tow. They were in the baggage claim area and were in a hurry to find something and stopped at hte information desk to ask directions. The cameraman was working to capture every move. The men were both short and appeared to be related. One had a fanny pack that was visible with red/yellow/back horizontal stripes on it. 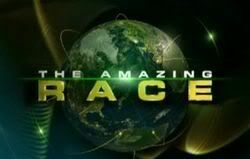 We went up to them and said "Are you with the Amazing Race?". They said "No", but we are waiting for cast pictures to see if they were telling the truth or not. It very well could have been Mark and Michael. Sounds like them. And Dr Rox. I think you really have hit the nail on the head!! Olympic-sized challenge that leaves Teams gasping for air shouts swimming challenge to me, hopefully at the Olympic pool site: the "Water Cube". Maybe as a possible task, teams have to swim and complete all eight Olympic races that Phelps won gold in. That would be an Olympic-sized task -- and one that would leave teams gasping for air -- literally! Considering how many competitive swimmers would struggle to complete a long coures 400 IM or 200 fly, my guess for a swimming-based task would be some short relay like they did with the kids running in Arfica in TAR 6, or else something like doing 800 meters of freestyle, which is far more doable for a casual swimmer if they take their time and rest on the walls or lane lines as needed. That one could not only really separate out the field because ability levels can vary so much, but you can also make the other racer hold the lap cards and that makes for a fun visual. Could this quite possibly be a dreaded INTERSECTION, as well...The two teams pair up and have to swim a 400M freestyle relay. Each member only has to swim one length of the pool, but you would have to hope that all 4 members of the group were competant swimmers. Jamie & Cara are on the Segways, their coats even match the Salzburg blurry blog pictures, they are the only ones shown on the Segways just to clear that up. "Two women were running together. One was hobbling. The other said, "I'm going ahead a bit," and the other countered with, "OK, go ahead." Off into the park they went, clueless as the day was long." So did one of them hurt themselves falling on that Segway? And the cakes have to be JUST before the PitStop, or they would have been cleaned up before the source saw them, right? ^^ thats why I'm wondering if Cara and Jamie switched detours? then the paragliding as well thanks the Uncle Bill, Slowhatch, DrRox, Chateau.. 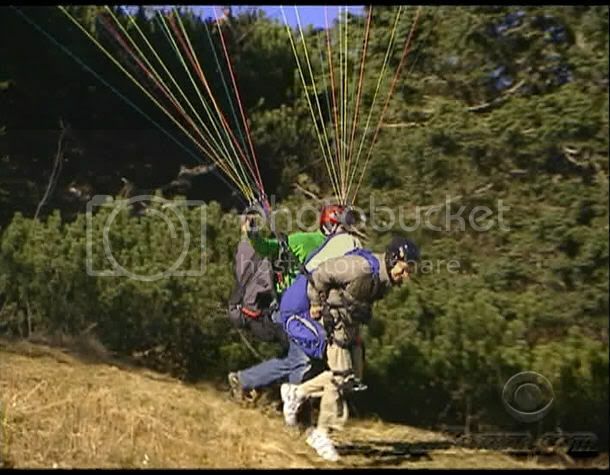 I agree, the green jacket would be the pilot, but guess the person in the grey fleece could be Mel? hard to tell, I thought at first look it might be Christie! It is Mel! You can hear him saying "I would lose the race for this" in numerous spoiler promos!